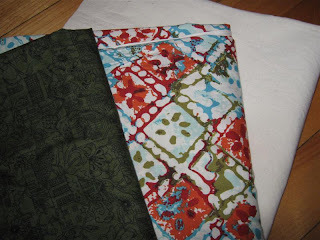 Do not go to the Sew, Mama, Sew! 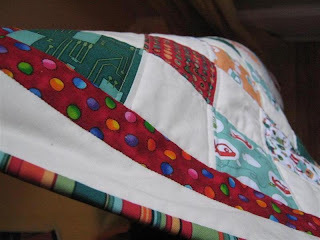 Blog, and under no circumstances click on "Continue reading “Handmade Holidays III” »", if you do anyway, do not click on the "last year" or "year before" links, because you will - like me - spend 4 hours online browsing tutorials, use up your ink printing out the good ones and your memory space with the ones you save. 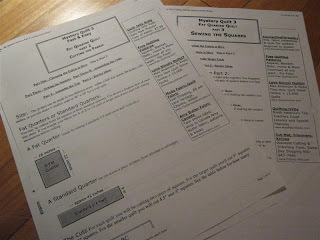 Don't say I didn't warn you... what a resource that blog is! 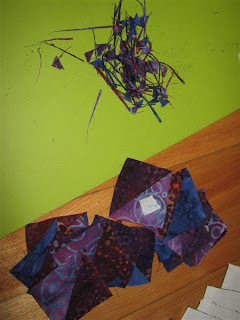 I've started sorting through all my scraps. I'm really torn between the different sorting choices. 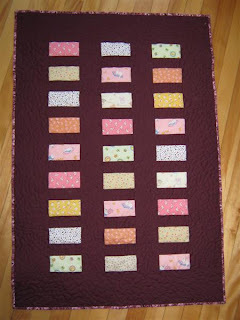 Sort with having a quilt pattern in mind? 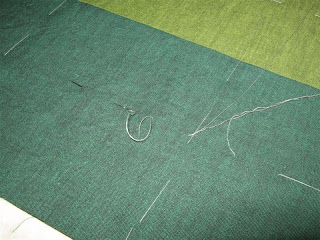 As you can see by these strange lines, I basted with thread instead of pins this time. 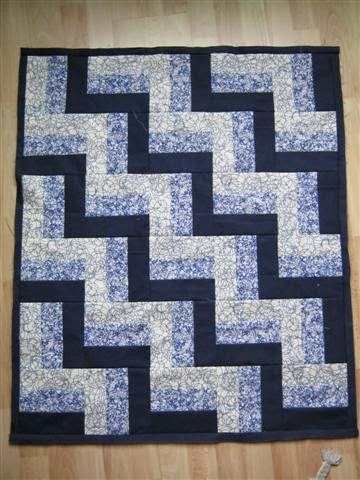 Because I've decided that I need to spend LOTS of time with this quilt since I'm in love with it and want to bond properly. So I will be hand-quilting this puppy :) Wahoo! 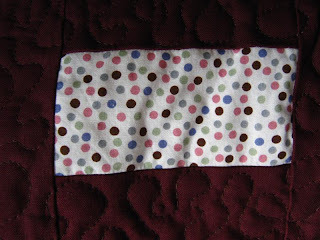 Here's the backing fabric - it's just as soft as the front fabric, though it's not from the same line. It was a steal at 3$/m! 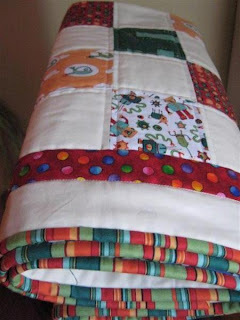 Good night lovely quilt! 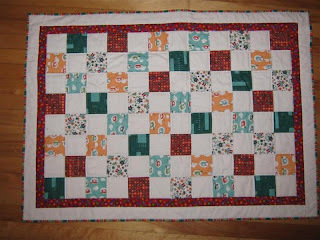 (The instructions said to remove the snaps so the quilt can breathe, oh dear :) I assume they mean 'so it doesn't crease' haha! 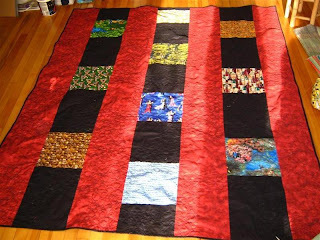 Last week I went to the monthly quilt guild meeting for the second time and this time I joined. They had a really neat new thing: visitors got a white-star felt name tag and new members got a tag in a heart shape. Old members were asked to make everyone with a star or heart especially welcome and it totally worked. People could easily see that I was new and they had my name so starting a conversation was easy! Best of all, the programs coordinator mentioned to me that the guild executive goes on a weekend retreat every fall, and there were three spaces still open and wouldn't I want to go along? Yay! 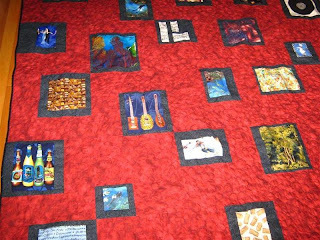 Great for me as newbie to see a) what it's like to quilt alongside other quilters on my own projects and b) get to know some of the other members of the guild, c) learn lots of tips from all the experienced quilters that will be there, and d) to get to see a beautiful B&B in PEI for a really good price (2 nights plus meals for 100$, holy cow!!!) . 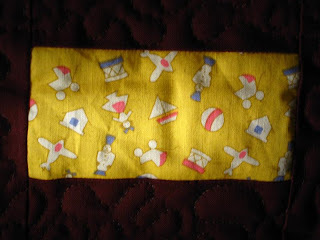 I ended up taking advantage of the guild's quilting library and borrowed one of the Elm Creek Quilts books that I hadn't read yet (probably because my town library doesn't have it - I wonder how many more are out there... chould look it up online I suppose). 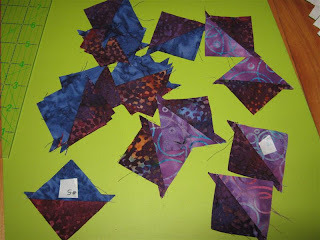 Once I figured out which fabric is which, I started on the small half-square triangles. 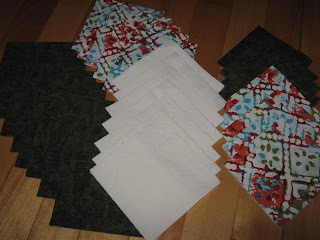 Because all this wasn't enough, I also signed up for the Mystery Quilt. I've heard about them, but had never done one before. 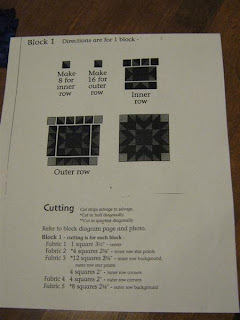 Again, we got instructions (they're on step 3, but I didn't miss much because step 1 was picking fabric and step 2 was cutting). 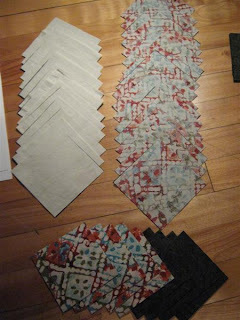 I cut enough fabric for the smaller of the two size choices - what they call a wall hanging (38"x38"). 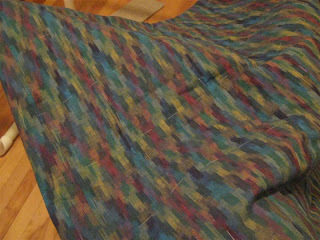 It was that or a queen size quilt, and not knowing what it'll look like in the end, I didn't want to take the risk. 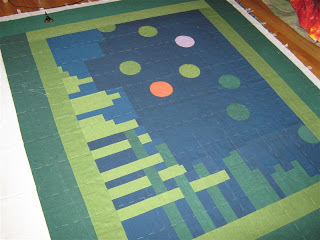 Plus, the bigger quilt just uses blocks twice as big - and 9" half-square triangle blocks are not really my thing I'd say. 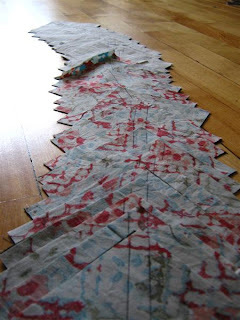 Then I went on to step three and matched up all the slightly larger squares destined to become half-square triangles and sewed them together. 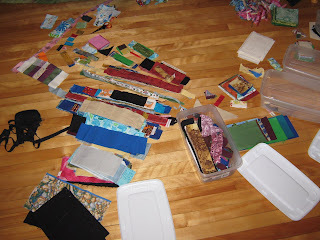 Also a lot of sewing! 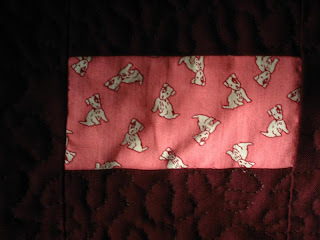 Now, I don't really like cutting the little corners off after I iron the blocks, so I did it before I cut the squares in half, by snipping a wedge out of each corner between the seams, just a tad pointier than a 90 degree angle. 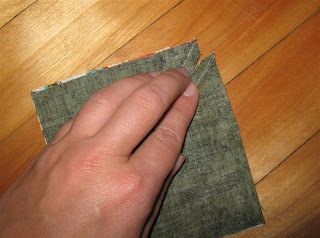 Not sure if it saved any time, I guess I didn't have to pick up as many pieces, as I cut the eqivalent of 2 HST blocks with every piece I snipped. So, I'd call that a case of me jumping in with both feet! Oh, and I'm the youngest member by three years. 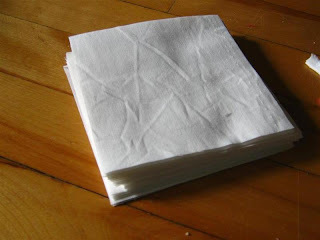 The next one up turned around in her seat, grinned and said "Yes! I'm not the youngest any more!!!" She was busy during the meeting making a Grandmother's Flower Garden out of less-than-penny-sized hexagons. 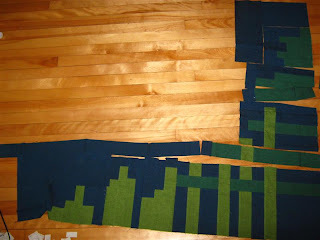 I mentioned that the pattern is aptly named, because she'll likely be a granny by the time it's done. The patience some people have!!! I'm so excited about the next meeting! A give-away not to be missed. I'm drooling. 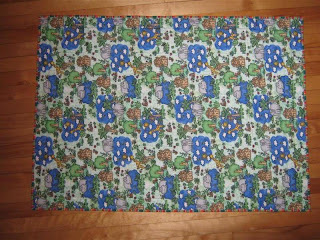 In May, I bought some fun farm animal fabric in BC. I started cutting out some animals in the summer, but never did anything with it until last week. 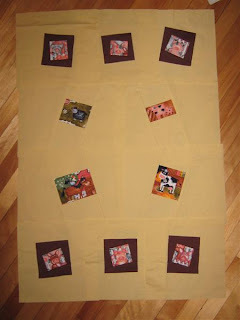 I tried some wonky arrangements, but I'm not quite happy with my dancing farm animals. Way too much background yellow. 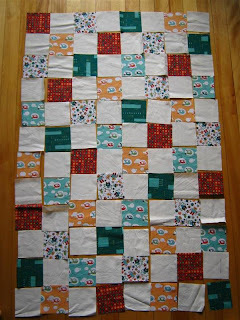 The 10 yellow blocks are still loose at this stage, and I'm trying to figure out how to fill up the space in between. 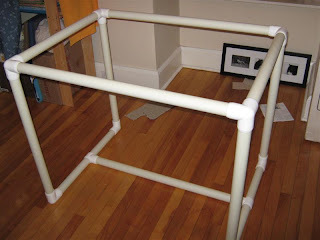 Should I quilt something elaborate with brown thread matching the pig-frames? 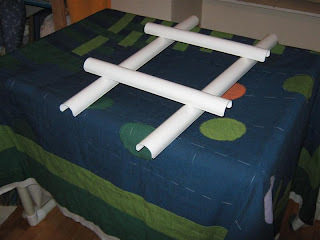 Should I sash the blocks? 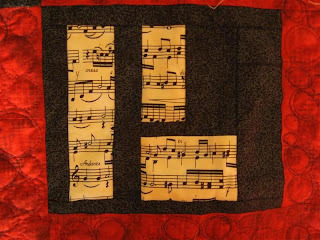 I found a new, very cool blog called Film and Thread and this post in particular showed a cool cool quilt. 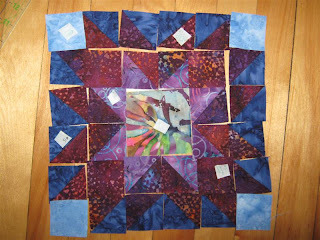 I thought that I'd like to try what I call an unbalanced design, where there either isn't a pattern or it doesn't continue over the whole quilt. 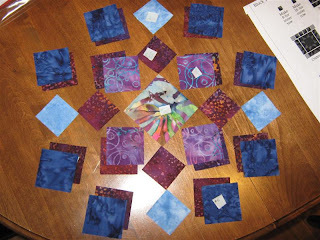 In my mind, I saw a white background with maybe blues, turquoises and browns, or maybe a MODA charm pack for the circles, for which I've found a tutorial here. 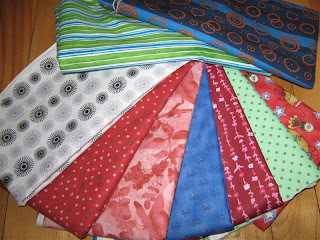 However, the decision was difficult until I remembered my 'soft' fabric! 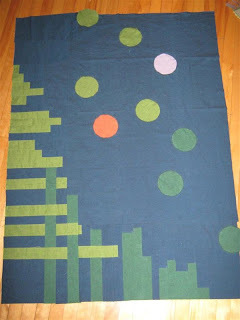 I blogged about this AGES AGO! Way back when I first started. 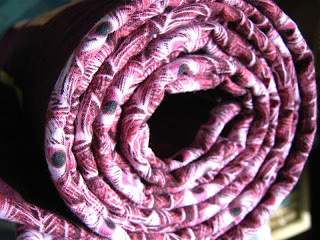 I loved the fabric for its soft feel, even though it's just normal 100% cotton. 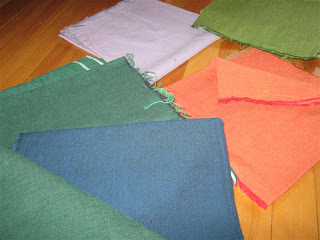 The fabrics aren't purely one colour though, the green for example has some orange threads woven in, it gives the fabrics much more vibrancy (more than you can probably detect on the photos :). 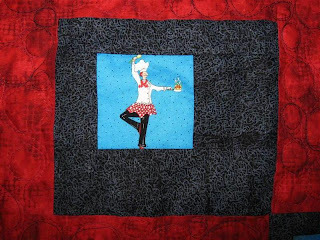 The whole thing was a figure-out-while-you-go project, mostly fun, sometimes frustrating, and it ate up my entire weekend, but gosh, that quilt needed to get out of my system! 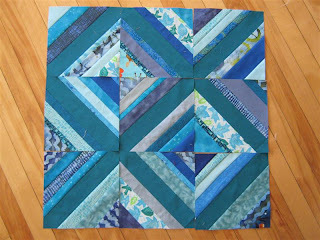 I very nearly ran out of blue, I have a few 6" pieces left over, but that's it. 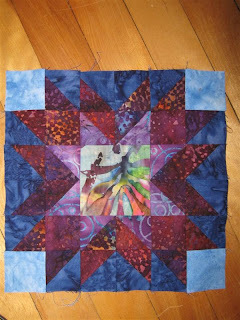 I had hoped for the quilt center to be much bigger, but really wanted the blue as background. 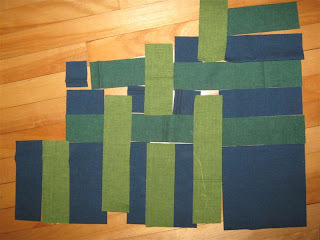 At this stage, it measured about 40" x 50", but I'm putting light green (4" wide) and dark green (6" wide) borders around it, so it'll get up to a decent lap quilt size. 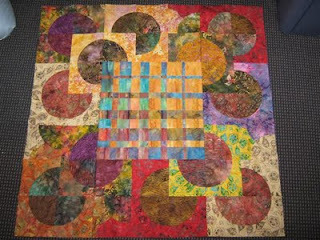 Even just the center was bigger than the current lap quilt I'm using, which is just a teensy bit too small for my likes. 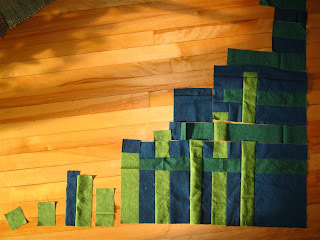 I'm very very excited for this quilt to get finished. 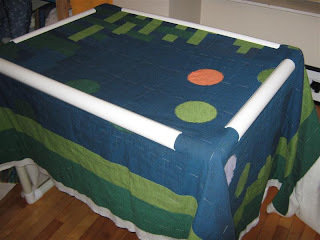 I have lots of green fabric left for the backing, and this soft quilt will be mine and mine alone! Robots Are Ready To Roll! 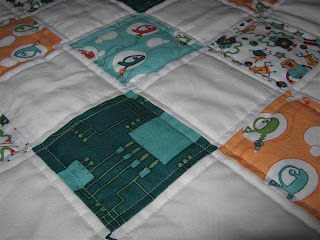 I was a busy girl yesterday - apart from blogging and answering comments - and finished binding the robot quilt. 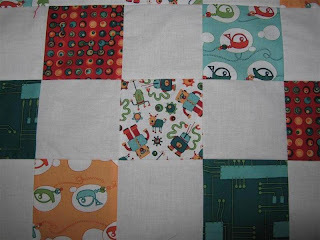 Funnily enough, I've seen a few recent robot-themed quilts in the blogging world since I started working on this one - must the the season for robots??? You must have heard about it! 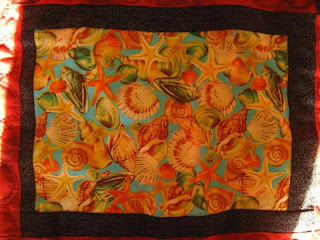 It's time for the Fall Quilt Festival! 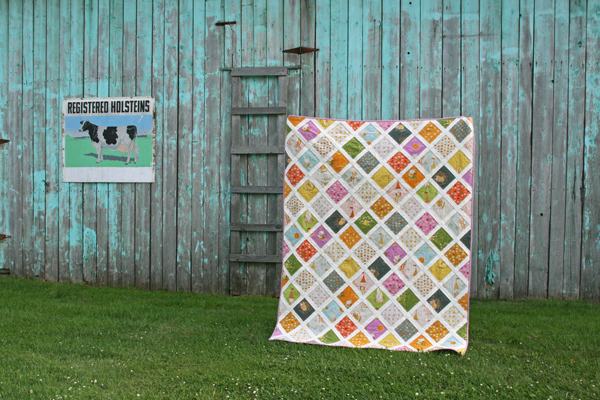 This quilt is for someone very special in my life, a friend with a 'boy' in front of it. 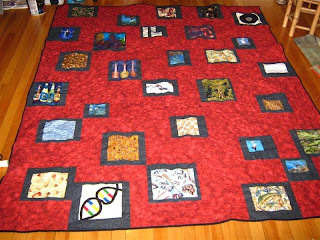 This quilt taught me a lot. 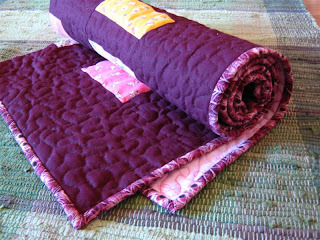 I also learned how kind fellow quilters are! 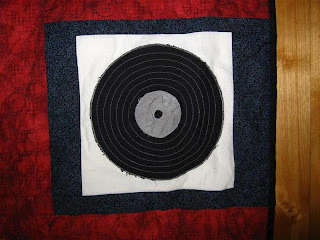 It was a lot of work, and like everyone says, it uses a lot of thread, but I love the effect, it feels great! 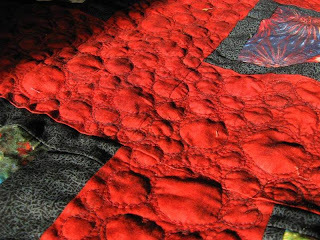 I put the final binding stitches in 30 min ago - it's really hard to sew on black binding to black backing fabric using black stitch - lighting is key here. 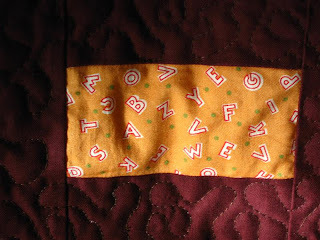 Of course I used Mal's invisible ladder stitch for the binding, the link is in my Quilty How To's menu on the right. This will be one great birthday gift next month! 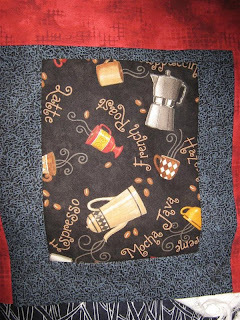 Now let's see your quilts! 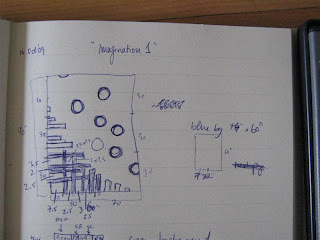 When inspiration strikes, it should not be ignored - that's my motto! 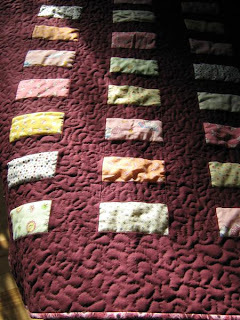 I was tired of hand-stitching the binding on the character quilt and also fed up with working on a quilt I'm making on commission for a work colleague - it's been intense quilting on that project all weekend. 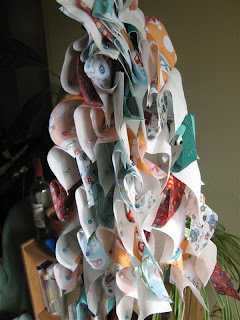 So I browsed some blogs and found this one, which I'd bookmarked and always wanted to adapt to my own fabrics. 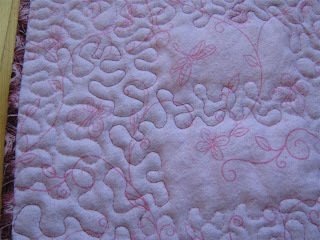 Well, there was nothing stopping me really - it's the beauty of quilting, you work on whatever you feel like! No deadlines (generally), no pressure. 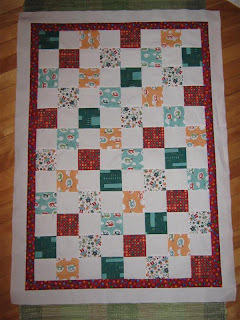 and 1-2-3 there's the quilt top finished! I love it when plans work out. 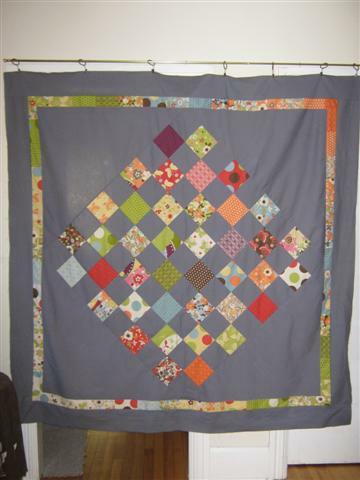 I brought this baby quilt along on a work trip last week, after a marathon-session on the weekend during which I quilted the whole thing, made the binding and machine-sewed it to the quilt top. 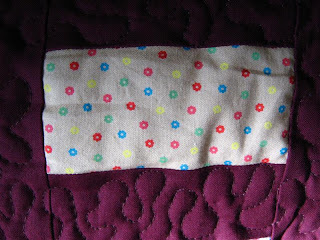 I finished hand-stitching the binding on the first evening of my trip, yay! 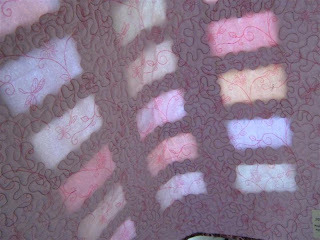 4) but the best is this amazing see-through effect when I hold the quilt up against the light! 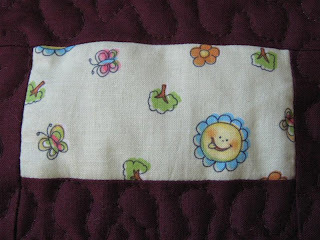 I hope some baby will have fun with this quilt some day. 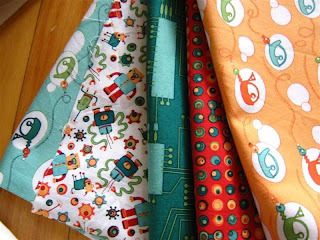 I'm making all these baby quilts to sell and make a bit of money to pay for all my fabric purchases (though I haven't bought anything in ages after the buying frenzy earlier this year!). 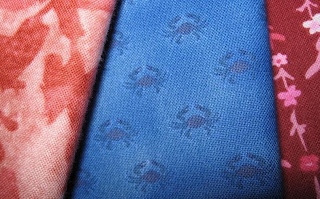 1) customers can't see my work before they buy it; I mean, yes there are photos, but you can't check out every detail online, you can't feel the quality of the fabrics etc. I'd feel horrible if a customer is not satisfied with their purchase! 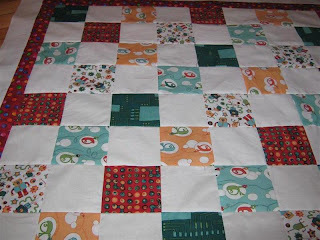 3) How do I know how much to charge for a quilt? Is there a formula? Do I just pick a number? 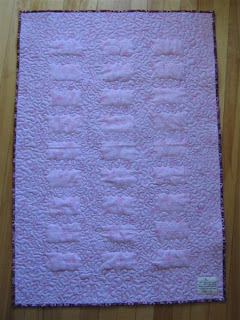 Do any of you have experience with selling quilts? I'd love to get your input!